Girrrl Stop! : Girrrl Stop! Get Something to Drink!!! Have you ever been so dehydrated that when you finally get something to drink, you don’t care what it is as long as it was cold and wet? It doesn’t matter much what it is because quenching your thirst is the only thing that matters at that point in time! This is ok on that super hot summer day but this doesn’t fly well in relationships. Girrrl Stop being ‘Relationally Dehydrated’! Most people would refer to this as ‘being thirsty’ and as much as I loathe that term it applies sometimes. Let’s define what relationally dehydrated is versus what it is not. When you’re relationally dehydrated you settle for almost anyone and any type of behavior. Girrrl Stop and get something to drink please! Don’t be the woman that’s with a man just to say she has one. When the reality is with all of his junk and drama you don’t really have a man anyway. You end up having a bunch of headaches and unnecessary stress in your life! The world says, time is running out, you’re biological clock is ticking - this causes many women to go completely nuts and date the first man that walks through the door! This ‘fear’ leads to many toxic relationships and just plain ole poor decisions. God says, I transcend time - if we focused on God as the author of time, this would calm the angst that the world tries to stir up. He is the Aleph and the Tav (you may be more familiar with the Greek translation Alpha and Omega) which means he is the beginning and the end. If God has the start and the finish, why stress over the middle! Just remain open to the Holy Spirit and God’s direction for your life! However after her encounter with Jesus Christ, her life was never the same. 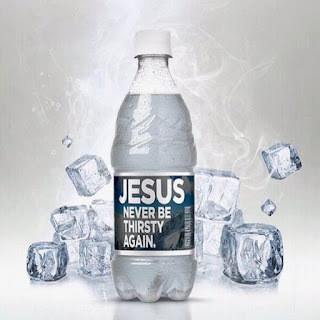 Girrrl go get a drink of the Living Water and quench your thirst! I love this article. The drink that quenches your thirst and won't make you fat with added calories. Preach on young sister!! Ah man! I should've used that calorie analogy!!!! I love it :)!! !